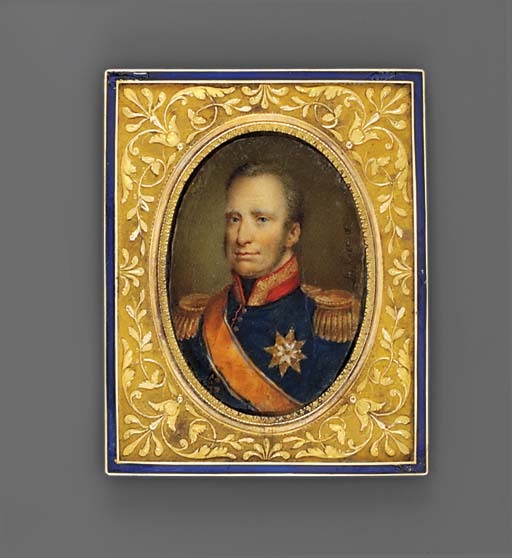 William I Frederick of Orange-Nassau, King of the Netherlands, son of William V and Frederica of Prussia, married Princess Wilhelmina of Prussia in 1792 and secondly in 1841, Henriette d'Oultremont. Joseph Charles de Haen was court painter to King William I and two of his miniatures of the King's beloved daughter, Marianne (1810-1883) are in the Royal Dutch Collection (see K. Schaffers-Bodenhausen/M. E. Tiethoff-Spliethoff, The Portrait Miniatures in the Collection of the House of Orange-Nassau, Zwolle, 1993, no. 237, p. 60, no. 73, illustrated p. 129).